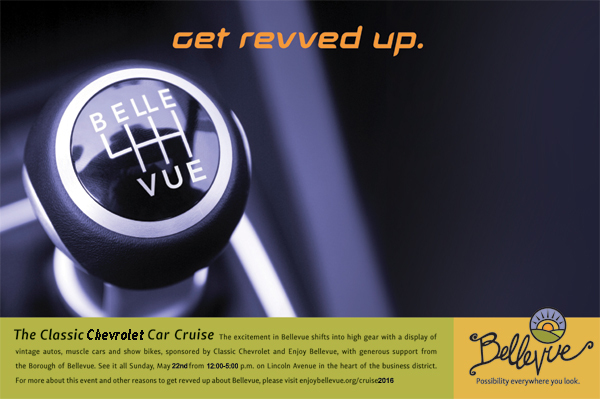 Make and post signs "CLASSIC CAR CRUISE - MAY 22 - 12-5 PM" at Bellevue exit 279, Chateau Street, ORB North and South of Bellevue. Make directional signs. Bellevue Police post No Parking signs after 11:30 am on Sunday May 22 from Florence to Fremont and bag meters between Florence and Fremont. Provide directions to drivers of the show vehicles to register at the booth at 500 Lincoln Avenue to receive one of the 100 limited dash plaques.